CNEWA - Picture of the Day: "A Window to Our World"
Nimer Nidal, 13, a student of photographer, Rich Wiles, at the Lajee Center in 2005 produced this photo as a part of a collaborative arts project entitled “A Window to Our World.” The Lajee Center, in the Aida Refugee Camp in Palestine, provides youth living in the camp with an opportunity for recreation, education and cultural activities. 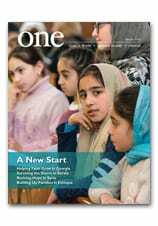 To learn more about Rich Wiles’ work with the children in the Aida Refugee Camp check out our interview with him in the November 2010 edition of ONE. Diane Handal's story, Living in Limbo, also from the November 2010 edition, will provide more insight on the state of children living in Palestinian refugee camps.